Marshrootka | The most common way to get around in Tbilisi (and Georgia in general) is by local minibuses (known as Marshrootkas). They cost 80 Tetri (0.80 GEL) paid directly to the driver when you get off. Marshrootkas go by designated routes. The marshrootka number and the description of the route are written on a sign which is placed under the windshield, but it is only in Georgian. 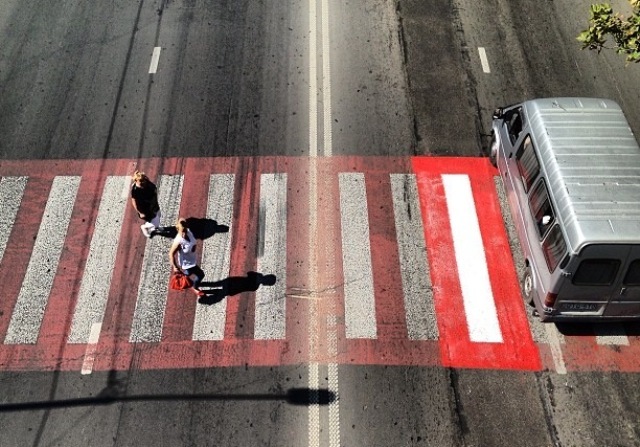 To get a marshrottka driver to stop, you need to shout ‘gaacharet!’ which means ‘stop!’. Bus | Buses in Tbilisi are yellow and come in various sizes. The ride costs 0.50 GEL, and exact change is required if you don’t have a touch card (which can be purchased at metro stations). Keep the ticket you receive on the bus, as you will need to present it to the yellow-shirted ticket checkers. The routes are described on the windows of the buses, and the drivers stop at certain bus stops. Taxi | Taxis can be found almost anywhere and are a good way of getting around the city. If you are not familiar with the city and do not know what your ride will cost, make sure you agree on the fare before getting on. It is better to insist on paying beforehand. A short ride of a few kilometers in the central areas costs 2-3GEL, longer journeys may be up to 10 GEL unless you are going to the airport. 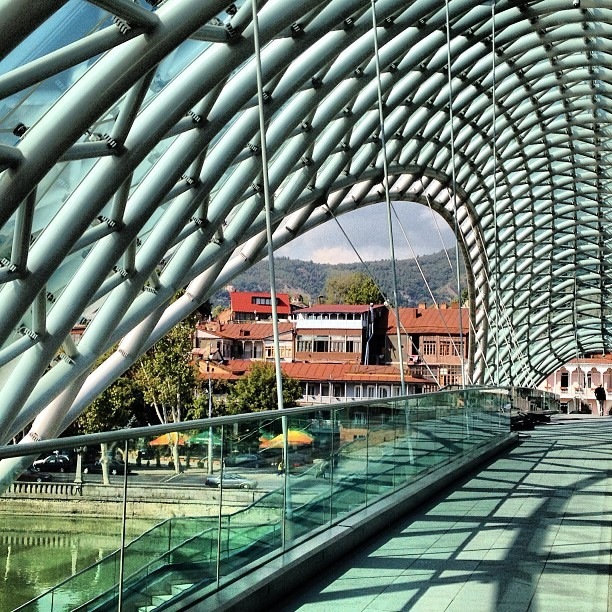 Metro | Tbilisi’s two-line metro, served from 6:00 AM until midnight, connects you to most important parts of the city, meeting at Vagzlis Meidani station. The names of the stations are announced both in English and Georgian, but the signs are often in Georgian only. A trip with the metro in Tbilisi costs 0.50 GEL, but you will have to buy a card (2 GEL) at the counter. You can load the card with any amount you like, and use it for travel both on the metro and on buses. Using the metro card, metros and buses cost 0.50 GEL the first time in the day, then decreases to 0.30 GEL the second time, then 0.20 GEL the third time and all future rides on that day. 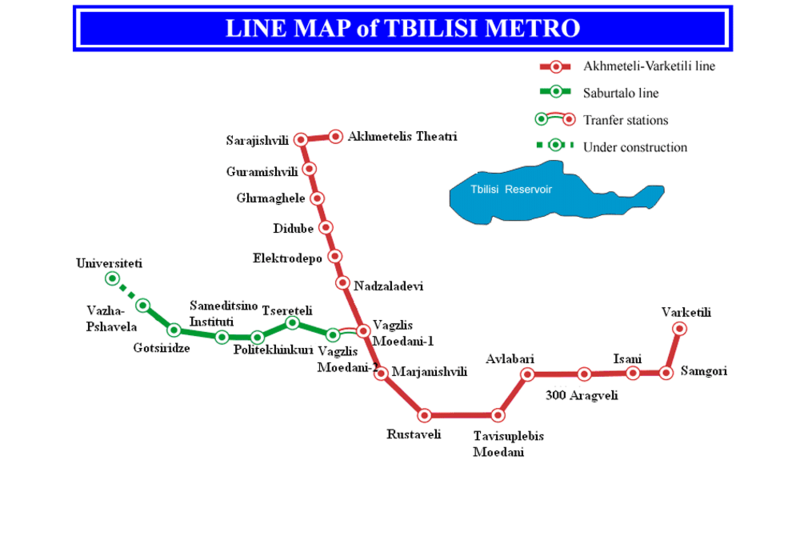 For your convenience, here’s a map of the Tbilisi Metro lines.